This mural was commissioned by the County Board of Supervisors Office as the centerpiece for the county booth at the Sacramento State Fair in 2004. It won the Bronze Medal for Best Display. 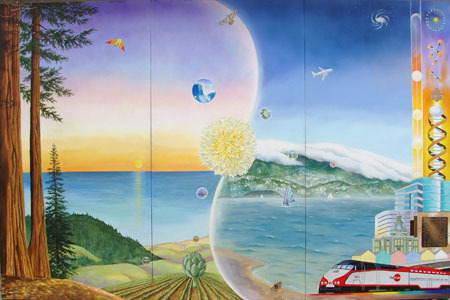 After the State Fair the artist reworked some details and enhanced the mural for installation in a public access site at the entrance to the Hall of Justice in Redwood City. Location: San Mateo County Government Center, Hall of Justice, Redwood City CA.